Once you’ve found the perfect social intranet software, how do you launch it in a way that gets great adoption and participation? Throw a party of course! One of our customers went above and beyond with their launch party for MangoApps (Internally called Solera “Hub”) and resulted in almost 100% participation. Results are of course not guaranteed and may need a few tweaks here and there to suit your company culture, but Solera is a great example of how to have an outstanding software launch party. First, in addition to following the other 4 steps to successful deployments with planning, monitoring, and watching what to do, Brian prepared before his software launch party by selecting some internal influencers or “Hub Honchos” to champion the “Hub” network. These users were brought in during the planning stages and the smaller pilot and became the support staff for the rest of the users. 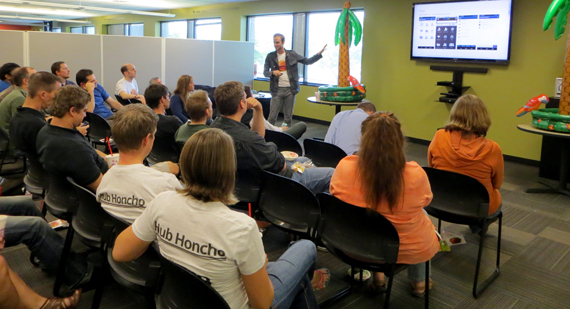 Brian and his team even made “Hub Honchos” t-shirts for his support team, making them easy to find and identify. “Hub Honchos” were from a variety of departments across the company, guaranteeing that every part of the company was well supported. Nice planning Brian! Check out those “Hub Honcho” t-shirts pictured below. Then Brian and his team started planning the software launch party. 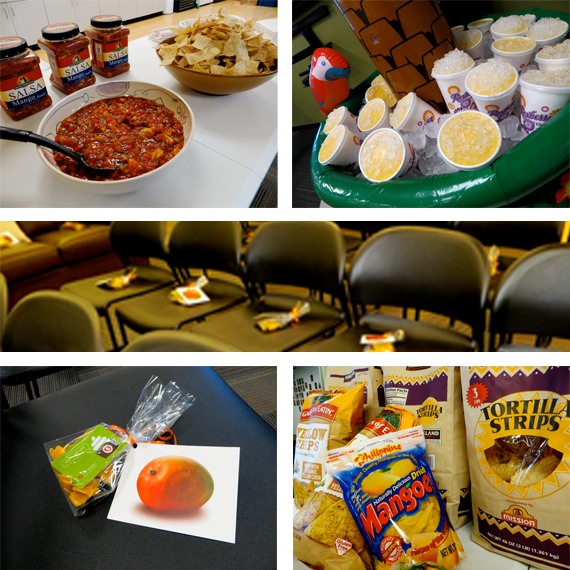 Since they chose MangoApps for their company, he owned the Mango and encouraged the new Hub users to “Savor the Flavor.” This included a tropical themed party with palm tree decorations and providing several Mango flavored refreshments. On the menu were Mango slushies, dried mango fruit, Mango salsa and chips and even a gift certificate to RedMango for hopefully, Mango froyo! Finally, after the party, Brian gathered everyone into the lunchroom where he held their attention for at least as long as they drank their slushies for a quick demo. He showed them how to launch the top level features, introduced the Hub Honchos to the group for support, and sent them on their way to start using the software.